I have moved, previously I lived in town with no deer problems, now… I live in town with no deer problems. However I have property where I’m building a house up in a relatively rural area, and there are deer. Because I am such a gardening fanatic I have been planting fruit trees up there, hoping to hurry the day when I can get my first harvest. However, the deer kept eating the leaves. Deer love the leaves off new fruit trees, they’re nutritious, a delicacy. Some of the trees survived the frequent defoliations, others did not. Now, despite living in town recently, I am familiar with deer, very familiar, as I grew up out in the woods and my parents still live there and I have helped them deal with their garden issues. One thing that worked for them was the motion activated sprinkler…when they remembered to turn it on, and it would only cover a small 20×20 or so garden. The only really surefire way to stop deer is a fence, and despite it being ugly I’ve really had no choice but to fence in my trees. This isn’t permanent, you just need to do this until the tree gets larger and established and has branches above deer browsing height. The good news is, this is really easy, all you need is some fencing, bought inexpensively at a big box store, some zip ties, bolt cutters, and some stakes. If you can find 8 foot fencing you’re all set, if not, you’ll need to get a couple and zip tie them together. I needed to do the latter. So I got a 5 foot fence and a 2 and a half foot fence. Simply unspool the fence until you’ve got a segment that has a diameter of at least 4 feet, snip it off the fence roll, put it around your tree that needs protection, and ziptie it together. If you need more height make a matching segment of another fence and ziptie it on top. You then need to stake it to the ground, you can use the green fence stakes, rebar, bamboo, just something you can drive into the ground, then ziptie the fencing to that as well. You now have a deer proof cage around your tree. Rinse, repeat. In the end it is not an attractive look, (you can get green fencing to try to make it blend in a little bit), but it is not permanent, after a few years the trees will be large enough to not be killable by a munching deer anymore. For the math less inclined, you need approximately 12 linear feet of fencing to make a circle with a diameter of 4 feet (and really, the wider you can make it the better). So a 100 ft roll will do 8 trees. 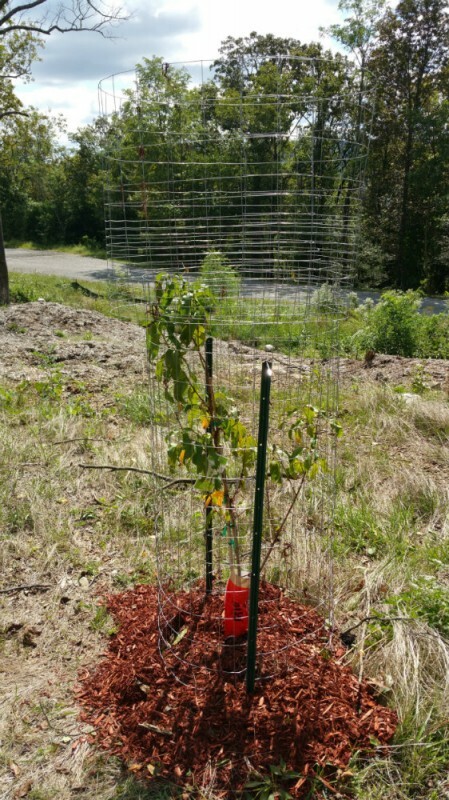 When the trees do outgrow the need for fencing, the fencing is not garbage, you can repurpose it to protect new trees, build a garden trellis, or probably one of a hundred other uses. Fruit trees aren’t the only thing deer like. At our farm, the raspberries before the stickers get them. Also the iris plants. they don’t die, but no raspberries where they have eaten off the tops. On our farm in Victoria, Australia, we have kangaroos and wallabies chewing the leaves of trees. One tip I have used successfully is to cut back a little on the leaf/stem that was chewed. Here it is the enzymes in their saliva which can kill younger trees. My sister in law in England has grown gum trees on her driveway and of course, deer were delighted to chew on those. I told her to cut back the leaf/ stem that was chewed and her gum trees are now sky high. Deer will eat almost anything. Ours recently developed a taste for peppery things like nasturtiums, arugula, and even piquillo peppers. After they ate all the tomatoes, I fenced the whole yard (http://www.friscovista.com/news/animals/bambi-flummoxed/). Physical barriers are the only thing that works. Those pesky deer have a passion for the new gems we place in our garden! Fences are really a great option. The product Plantskydd has provided great relief from the deer, found the liquid works the best. An old farmer trick is to use hair clippings. It would be difficult to provide all one would need. A local barber could be helpful. Wow! You’ve got a cool easy idea on dealing with that frustrating garden dilemma. But wood fencing I believe is much better… However, it depends on what would be fitting to your comfort. One thing, I wonder your place is one of the nicest place for home gardening. All “wilds” are around, hmmm…That’s great to imagine!